Statewide basin-filled snowpack map January 3, 2019 via the NRCS. “I’m so glad it’s cold,” Johnson said, adding that she often surprises people who complain about frigid temperatures. 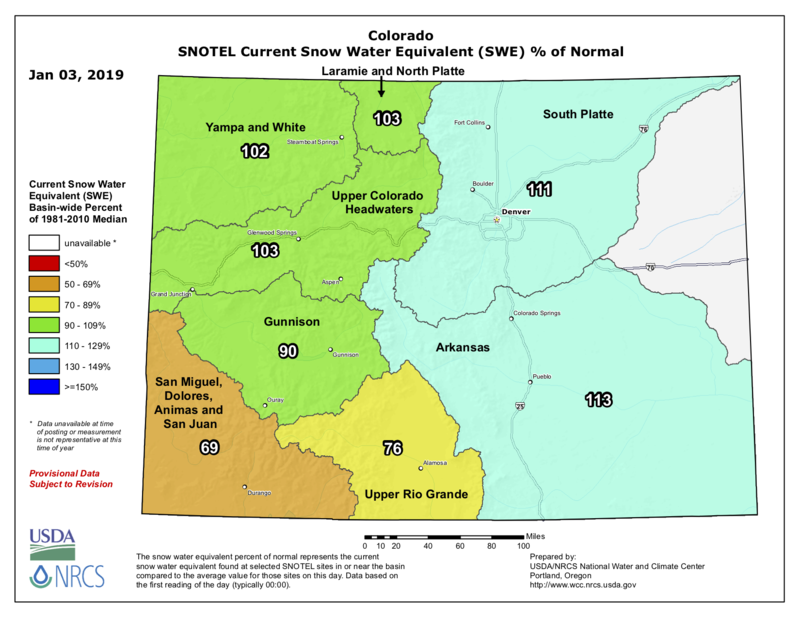 As of Dec. 31, 2018, the Yampa and White River basin had 107 percent of the median snow water equivalent, which is a measurement of how much water is contained within snowpack. At the same time last year, the valley had received 65 percent of the median. Steamboat Resort has more snow days than not, with snow falling on 37 of the 63 days the resort has been open. Fifteen of those days were powder days, according to Steamboat Ski and Resort Corp. Senior Communications Manager Loryn Kasten. In Routt County, the Natural Resource Conservation Service’s snow telemetry sites have received an average of 34 inches of snow. The thickest snowpack is at the Tower site on Buffalo Pass, with 64 inches. The thinnest snowpack is at the Bear River and Lynx Pass sites in South Routt, both with 25 inches. “Keep doing your snow water equivalency dance,” [Kelly] Romero-Heaney said with a laugh.